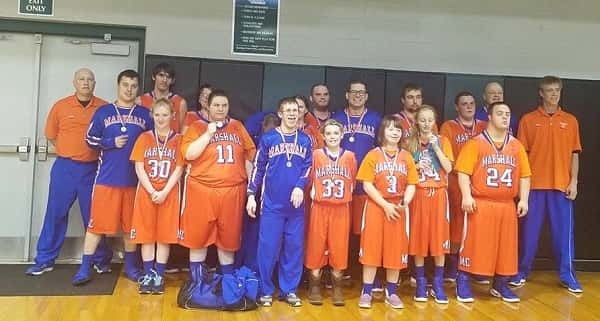 BOWLING GREEN – The Marshall County Special Olympics basketball teams had an exciting day competing in Bowling Green in the 1st Region basketball tournament on February 11th. Marshall 1 competed in the B blue division with a 28-10 win over the Murray Rockets Green team led by Jennifer Irvan and Edward Burkeen with 8 points each, but fell short to Trigg County in the regional Championship. Edward Burkeen led the team with 11 points. Both the champion and runner-up advances to the State Tournament in the B blue division. Marshall 1 comes away with their 4th straight Regional Silver Medal. Marshall 2 competed in the 1A Green division with two very exciting games. They overcame a slow start to beat Muhlenburg County 25-19 led by Christian Andresen’s 13 points and saw a rematch of last week’s triple overtime game with Russellville. A free throw to tie the game by George Navarre with seconds left put the Championship game in overtime. The Marshals defense was enough to hold on to the win defeating Russellville 29-27 with 18 points from Navarre. This was Marshall 2’s 5th straight regional title. They will defend last year’s state title in Louisville March 10-11 at Mid-America Sports Complex.